Fees paid under distribution agreements may be categorized and taxed as royalty payments if it involves incidental use of intellectual property. Incidental use of intellectual property, software, confidential information or customer data under distribution agreements could lead to payments made under such contracts being considered as royalty. Tribunal distinguishes current case from previous judgments on the thin ground that while taxability of payments towards ad space were decided upon earlier, the re-seller or distribution arrangement was not analyzed. While the Tribunal in the Google case took a dissecting approach to the interpretation of the contracts, the AAR has adopted a holistic reading of the distribution contract based on the intention of the parties. Transfer pricing issues in the Google case remanded back to tax authorities with direction to consider increased attribution of value to India on account of creation of unique intangibles such as customer lists, customer relationship, etc., and on a consolidated basis considering all services together as opposed to services under each contract. Recently, the Bangalore Bench of the Income Tax Appellate Tribunal (“Tribunal”) has passed its judgment on the issue of taxability of payments made by Google India Private Limited (“Google India”) in favour of Google Ireland Limited (“Google Ireland”) for the purchase of advertisement space for resale to Indian advertisers, as per a distribution agreement entered between the said parties.1 The Tribunal ruled that these payments were in the nature of “royalties” as Google India was using the intellectual property of Google Ireland for this purpose and was hence, subject to tax in India as per the provisions of the Income Tax Act, 1961 (“ITA”) and the India Ireland Double Taxation Avoidance Agreement (“Treaty”) and further, that Google India was required to withhold taxes on these “royalty” payments to Ireland. Within a couple of weeks of the order in the Google case, on a very similar fact situation relating to Akamai Technologies Inc, the AAR has pronounced a judgment that appears to be diametrically opposite to the Tribunal judgment in many ways. The background to these decisions, the analysis of their findings and the impact are set out below. Google AdWords is an online advertising service developed by Google, where advertisers pay to display brief advertising copy, product listings, and video content within the Google ad network to web users. The program uses the keywords to place advertisements on pages where Google thinks they might be most relevant. Advertisers pay when users divert their browsing to click on an advertisement. AdWords enables an advertiser to change and monitor the performance of an advertisement and to adjust the content of the advertisement. Till financial year 2004-05, it would appear that Google Ireland was directly selling advertisement space to customers in India.2 The payments made by Indian customers to Google Ireland directly were sought to be subjected to withholding taxes by the tax department. When an online florist in India that bought the ad-space from Google Ireland challenged this stand of the tax department, the Kolkata Bench of the Tribunal ruled in its favour, in the Rights Florist case, and held that the transaction is not taxable in India, since it constituted business income of Google Ireland and such business income could not be taxed in accordance with the terms of the Treaty unless Google Ireland had some form of physical presence in India that constituted a ‘permanent establishment’ (“PE”). The Tribunal further categorically held that there was no attempt made by the Revenue authorities to first establish taxable nexus under domestic law before going to the Treaty and that in any case, after a careful consideration, there could be no taxable nexus under domestic law under any limb of Section 9 of the Income Tax Act, 1961 (“ITA”) including that of royalty. Therefore, according to the Tribunal the payment made to Google Ireland could not be taxed as royalties in India and therefore there was no obligation on the Indian resident to withhold any taxes. The tribunal also observed that while it is possible that the conventional PE tests fail when applied to virtual businesses, it was still a policy decision of the Government to continue with such a test for establishing taxable nexus and that any inertia in fixing this would only be at the cost of tax certainty. Information technology (“IT”) services and information technology enabled services (“ITeS”) under a services agreement dated April 1, 2004 (“Services Agreement”). Google India is remunerated at a cost plus 17.5% basis for the IT services and a cost plus 15.5% basis for the ITES. Google India also functions as a non-exclusive authorized distributor of Google Ireland’s AdWords program in India under an agreement dated December 12, 2005 (the “Distribution Agreement”). In addition to its marketing and distribution services provided to Google Ireland, under the Distribution Agreement, Google was also required to provide pre-sale and post-sale / customer support services to the advertisers. Therefore, it would now appear that Google Ireland switched from its earlier model to a re-distribution model after 2005. Under this arrangement, Google India received separate payments from Google Ireland for providing the IT services and ITeS under the Services Agreement and made payments to Google Ireland for the purchase of AdWords Space under the Distribution Agreement. Google India did not pay any withholding taxes on these payments to Google Ireland as it was of the view that these payments should not lead to any Indian tax consequences, presumably based on the Rights Florist ruling since the nature of the payment had not changed and only Google India was making the payments instead of another company or business in India. The Revenue contested this in multiple assessment years and the Tribunal adjudicated upon multiple appeals filed by Google India and the Revenue against the orders of the Commissioner of Income Tax (Appeals) (“CIT(A)”) for these assessment years together as the underlying issue was the same. On 23rd October, 2017, the Tribunal at Bangalore issued a judgment3 in respect of certain assessment years on the issue of categorization of this income which is now pending in appeal before the Karnataka High Court. The Tribunal in the 23rd October, 2017 ruling had made a factual finding that both the Service Agreement and the Distribution Agreement are to be read together since many obligations under the Distribution Agreement could not be discharged without access to IP that was provided under the Services Agreement and on this basis the business income was held to be actually royalty income and hence taxable. The High Court in its wisdom directed that similar issues that were pending before the Tribunal in respect of other assessment years be decided without being influenced by this decision. The decision of the Tribunal dated 11th May, 2018 have broadly upheld the findings of the earlier decision and have raised several new issues as well. Google India explained that the payments for purchase of AdWords Space under the Distribution Agreement would be characterized as business income in Google Ireland’s hands. In the absence of a PE of Google Ireland in India, such income would not be liable to tax in India under the ITA read with the Treaty. Google India highlighted the inconsistent approach followed by the revenue in these cases by highlighting how the Assessing Officer (“AO”) had taken a stance that Google India was a dependent agent PE of Google Ireland for the AY 2008-09 and had never even suggested that these payments were in the nature of “royalty” for this assessment year. Historically, the Indian courts have consistently held that advertising revenue and payments made under distribution arrangements are in the nature of business income.4 Hence, such payments being made to a non-resident are only taxable in India in case it is demonstrated that such non-resident has a PE in India and such income is attributable to this PE. Further, Google India referred to multiple case law5 which accepted that mere incidental use of or access to intellectual property while providing services under an agreement would not result in the payments being made under such agreement being considered as royalty. However, the Tribunal distinguished the instant case from all these landmark rulings on the basis of the facts involved and refused to apply the same ratio here. Interestingly, the Tribunal went into a detailed examination of the Distribution Agreement and the Services Agreement and held that Google India was required to provide on-sale and post-sale technical services to the advertisers and Google Ireland which could not be possible without resorting to the Services Agreement. Further, it was found that it the ITES division of Google India which was responsible for providing support to the advertisers and Google Ireland. Hence, the Tribunal considered these contracts to be interdependent and held that they must be read together. The Tribunal relied upon the judgment of the Hon’ble High Court of Karnataka in the case of CIT v. Synopsis International Ltd.6 where it was decided that the mode adopted or the terminology given is not decisive to decide the nature of transfer, but rather it is the substance which must be looked into. In this case, the High Court held that while there was no transfer of exclusive right of copyright there was a transfer of certain rights which the owner of a copyright possesses and any consideration paid for use or for the right to use confidential information would amount to royalty income. The Tribunal held that the facts of this case were similar to that of the instant case as Google India had been given access to the trademarks, brand features, derivate works, confidential information and other intellectual property of Google Ireland for the discharge of its functions under the Distribution Agreement and the Services Agreement. On this basis, the Tribunal held that the payments being made to Google Ireland were being made for the use of these intangibles and therefore should be considered to be in the nature of “royalty” and not business income and applied the ratio of Synopsys International (supra) to the facts of the instant case. Article 12 of the Treaty prescribes a reduced rate of withholding tax at 10% in India in case the Irish resident taxpayer is also the beneficial owner of the royalty income being paid. 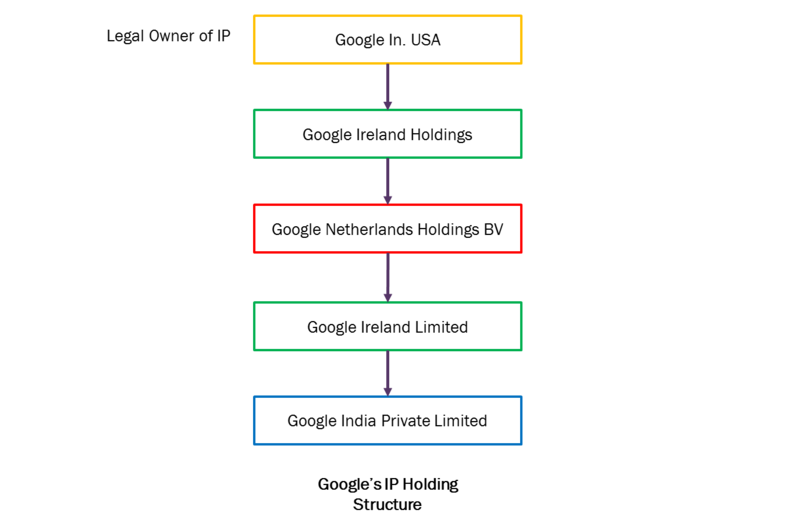 The Revenue took a stance that Google Ireland was not the beneficial owner of the royalty received from Google India and discussed the controversial “Double Irish Dutch Sandwich” structure which is used by Google to book its profits in a low tax jurisdiction like Bermuda. On this basis the Revenue sought to deny Google India’s claim to a reduced rate of withholding as available under the Treaty. The Tribunal referred to the fact that there are four layers of holdings of this AdWords program to decide that it was unclear as to how much right in license were conferred to different holdings and how the revenue collected on AdWords program is to be distributed amongst the above holdings. It further held that Google India had the onus of proving that Google Ireland was the beneficial owner of these royalties which it had failed to do by not placing all agreements entered into between the offshore Google entities before the AO and the Tribunal. The Tribunal did not accept Google India’s explanation that it did not have access to these offshore agreements on the basis that all Google entities are inter-related. The Revenue department looked at the Services Agreement and contended that data collection and data analysis is being conducted in India which creates significant value. On this basis they argued that the services performed by Google India are not mere IT services by rather Knowledge Process Outsourcing services (‘KPO’) and therefore, a higher attribution of income to India is required. The Revenue also sought to increase the value attributed to India by arguing that valuable human intangibles and customer related intangible assets such as customer list, customer contracts, customer relationship, etc., were being created in India. The Tribunal held that neither the Revenue department nor Google India were correct in their transfer pricing analyses and therefore remanded this issue along with the rest of the transfer pricing file to the tax department for a review on the basis of a profit spilt method. Further, the Tribunal also asked that the tax authorities to examine afresh the question as to whether Google India’s functions resulted in the creation of unique marketing intangibles or technological intangibles and whether these intangibles had been transferred to Google Ireland as part of their review of the transfer pricing issues. The Tribunal’s ruling goes against a catena of case law where advertisement revenue, and payments made under distribution arrangements had been characterized as being in the nature of business income. In these cases, the courts have refused to bring such income of a non-resident entity to tax in India unless it is demonstrated that such non-resident has a PE in India and such income is attributable to this PE. As a result, the primary issue in such cases has been the determination of a PE on account of a fixed place or dependent agent rather than whether such an arrangement will result in royalty income. In fact, as mentioned above, even in the instant case, for one of the assessment years in question, the AO had taken a stance that Google India was a dependent agent PE of Google Ireland and that the payments were in the nature of business income. This clearly highlights the inconsistency being shown by the department when it comes to considering the taxability of such cases. While the Tribunal did not consider the impact of the Equalization Levy (“EL”) in the instant case (since the EL was not applicable to the assessment years in question), this ruling could lead to unforeseen situations in future once the EL is applied. This is because a taxpayer may be asked to pay both a 6% EL and a 10% royalty tax on the same transaction while conceptually, it can only be either business income (and be subject to EL) or be only royalty (and be subject to taxes as royalty) but not both. This should be a concern for businesses as the Government has publicly announced that the scope of the EL is likely to be expanded in the future to cover other digital payments as well8. Thus, instead of seeking to tax non-resident taxpayers at a rate of 2-3% on the gross income (assuming a 15% profit margin and factoring for a 25% attribution to the non-resident’s Indian PE), it is possible that the tax authorities may expect these non-residents to pay a 16% tax on a gross basis. Such an increase in the quantum of tax may have a significant adverse impact on the growth of India’s digital economy. The ruling could have far reaching implications for all distribution businesses and especially those engaged in the digital economy. On the basis of this ruling, it is possible that the tax authorities may seek to classify business income as royalty even in cases where there is just a mere use of, or access, to intellectual property of a non-resident where they are unable to build a case for existence of a PE of such non-resident. Utilization of IP such as customer data, confidential information for performing services is a fairly common industry practice and the ruling raises concerns for taxpayers operating on the basis of these type of arrangements. A far reaching aspect of this ruling lies in the arguments made by the tax department and the finding of the Tribunal with respect to allocation of profits in relation to the services provided by Google India to Google Ireland. Currently customer lists, customer contracts, customer relationship, open purchase orders have not been recognized as assets internationally due to a lack of consensus and therefore have not really been used for functions, assets, and risks analysis for transfer pricing analysis. This move of the Indian tax authorities to unilaterally move ahead on this increased attribution of value creation on the basis of these intangibles without waiting for international consensus is of concern to multinational companies operating in India and will likely lead to more transfer pricing disputes, something which India has been trying to reduce by promoting advance pricing agreements (APAs). Google India has issued a public statement conveying its intention to appeal the ruling. Recently, the Authority for Advance Ruling (“AAR”), in the case of Akamai Technologies Inc., In Re10 , when faced with a similar fact pattern, has taken a contrary stance from the one taken by the Tribunal in the instant case. This case involves the resale of content delivery solutions (“CDS”) by an Indian subsidiary of a US company under a reseller agreement. The Indian company was required to pay a fee to the US Company as consideration for the CDS purchased for resale. The AAR was called upon to adjudicate on whether this fee amounted to royalty (amongst other issues). The reseller agreement allowed the Indian company to make use of the trademark of the US parent for the purposes of marketing and reselling the CDS. It is pertinent to note that the Revenue department presented similar arguments and relied upon the same case law (including Synopsys International (supra)) before the AAR as they did in the instant case concerning Google. However, the AAR distinguished the matter before it from these cases on the basis of the facts involved and commented that the landmark rulings being relied upon by the Revenue department had been delivered in the context of software distribution transactions where it was a copy of a software that was being resold or distributed to the end customer. In the Akamai case, while the Indian subsidiary obtained a right to resell the CDS to end customers, the program itself was not sold to it. This is strikingly similar to the factual scenario in the case of Google India and Google Ireland. In a significant departure from the approach adopted by the Tribunal, the AAR held that the reseller agreement should be interpreted holistically in the light of the facts and circumstances and the intent with which the agreement was entered into between the parties. The AAR found that from a perusal of the entire tenor of the agreement, the conduct of the parties, the business model and the various agreements with end customers, it was not borne out that the parties intended to enter into a license agreement for use of trademark for which payment has been made by the Indian company to its US parent. In view of the same, the AAR held these payments are in the nature of business income and cannot be covered within the definition of royalty and taxed as such. This AAR ruling could not have come at a better time and is a heartening example of a taxpayer obtaining the benefit of a favourable advance ruling on a subject in which the lower courts seem to be taking adverse views which are against established precedents. It is hoped that Karnataka High Court would follow the reasoning adopted by the AAR in Akamai Technologies Inc., In Re while adjudicating upon the appeal which Google India has promised to file against the order of the Tribunal. For instance, the ITeS Agreement has clauses that state that the IP provided under the agreement should not be used for any other purpose other than for discharge of obligations under the ITeS Agreement. Hence the question of use of IP for discharge of obligations under the Distribution Agreement is at best similar to any incidental use of IP in the Akamai distribution agreement and should therefore not be taxed as royalty. However, it is likely that ambiguity on the taxability of similar transactions and business models shall prevail till such time this issue is judicially determined by the Karantaka High Court or by the Supreme Court of India and other businesses operating similar models should expect tax notices till such time this issue is settled. 1 Ruling dated May 11, 2018. 10 AAR No. 1107 of 2011.